Dr. Leo Polosajian is board certified in internal medicine, cardiology and adult comprehensive echocardiography. He completed an extensive fellowship training program in Cardiac Electrophysiology at Cedars-Sinai Medical Center. 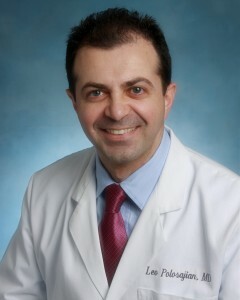 Dr. Polosajian is trained in cardiac catheterization and nuclear cardiology. He completed an extensive training program in peripheral arterial intervention and venous disease treatment and intervention. Dr. Polosajian completed his internal medicine residency at Columbia University’s St. Luke’s-Roosevelt Hospital New York City and his cardiology fellowship at the University of Connecticut. He also holds a Master’s degree in biomedical sciences from Barry University in Florida. Dr. Polosajian, fluent in English and Armenian, is committed to providing the highest quality care for his patients. His approach involves understanding the patient’s health care needs and implementing state-of-the-art techniques. He is extremely compassionate, and believes in taking the time to explain and discuss all aspects of care and treatment options with his patients. He is committed to the coordination of care for his patients with his colleagues.